To view all photos and information, Click Here. 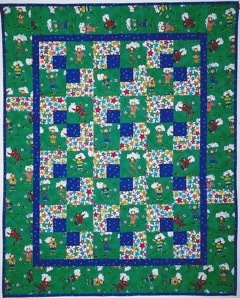 CALM (Child Abuse Listening and Mediation) requested 100 quilts, and we have more than met that goal with 130 quilts. Hooray!! Our members rose magnificently to the challenge of making cradle quilts and bedding sets, many from kits of orphan blocks and “bits and pieces.” These cradle bedding sets go with the wooden cradles made by the wood shop folks at SBCC and are donated to Unity Shoppe for Christmas gifts for low-income children. We delivered 190 cradle quilts with matching bedding, well over the target of 174, and we have saved 25 as a head-start on next year's goal. In all, we made 215! Well done!! 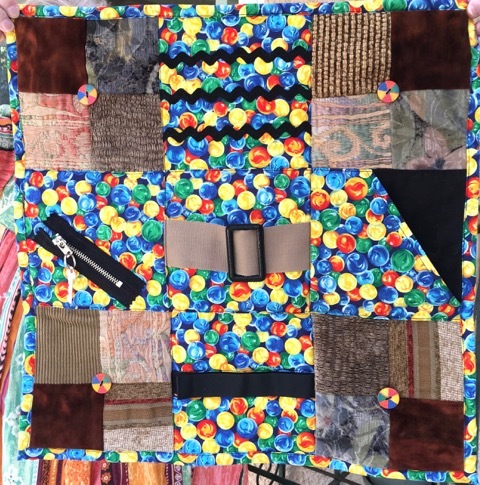 If you watched Unity Shoppe's December Telethon, you saw our work on display because the cradles and cradle quilts are THE most popular items that Unity offers. You also saw a quilt made by our members hanging on the wall. The quilt commemorates 100 years of service to the Santa Barbara community. Sarah House provides end-of-life care “with extraordinary kindness” to low-income members of our community. 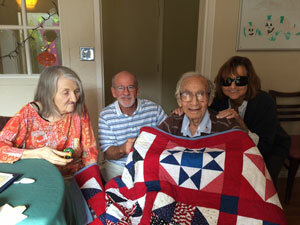 We delivered 8 lap-sized quilts plus one quilt for raffle during their annual fundraiser. In addition, we delivered many of member Pat Shewczyk's quilts to Sarah House, and they are grateful for this bounty of quilts. 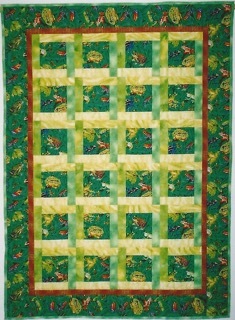 Pat donated her quilts to the Guild because her house flooded from a water leak and she was forced to downsize. We thank her for the donation. 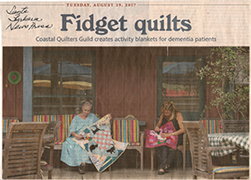 THANK YOU FOR YOUR SUPPORT OF COMMUNITY QUILTS! Check out our new Sew for Veterans Project page, at top left! 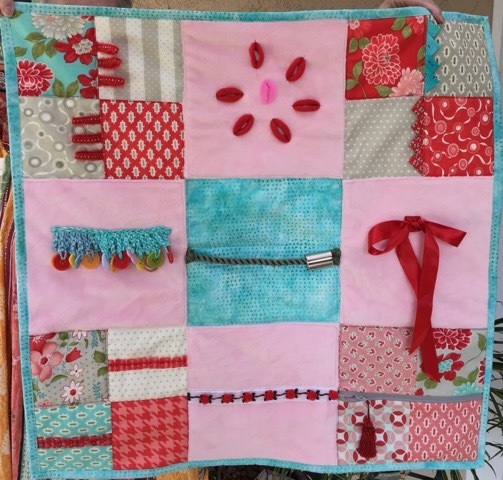 Then scroll down to find the slide show of all 93 quilts made for this project. CALM (Child Abuse Listening & Mediation): CALM's mission is to prevent child abuse with early intervention programs for at-risk families; to assess and treat child abuse where it has occurred; and to strengthen the family unit so that families can remain intact. CALM works directly with families and with individual children from infants to age 18. In addition, CALM provides prevention programs in elementary and pre-schools. CALM has requested 100 Christmas stockings and 100 quilts for children. 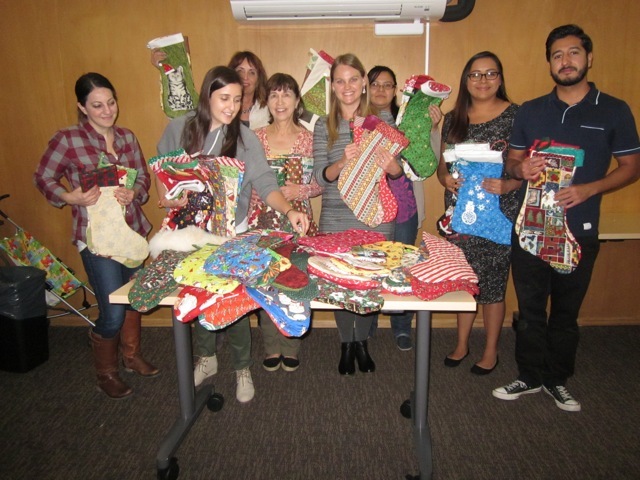 CALM staff members admire 100 Christmas Stockings made for the children they serve by members of Coastal Quilters Guild. L-R: Denise Crosby, Marianna Paredes, Mary Andrews-Dalbey, Sherry Robin, Nicole Ballas, Mireya Hernandez, Adelaida Gutierrez, and Horacio Rodriguez. American Charities Foundation: Based in Santa Ynez, American Charities keeps track of over 600 Santa Barbara County foster children, age newborn to age 18, whose families have been split apart by abuse, neglect or abandonment. Their programs, for children age 6-18, focus on building motivation for educational and lifetime achievement. American Charities has requested Christmas stockings, pillowcases, and support for their annual Christmas toy drive. 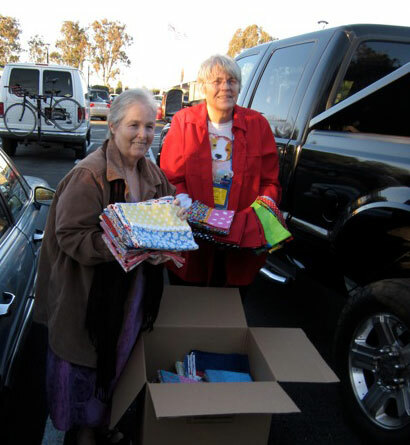 Carol Barringer and Bonnie Epperson deliver 171 pillowcases, 50 Christmas stockings and a box of toys donated by our members to American Charities Foundation for Santa Barbara County Foster Children. After Christmas, 24 more pillowcases were turned in and delivered, bringing the total to 195. Sarah House provides residential care for people who are very low-income at the end of their lives. 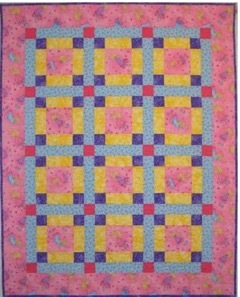 Sarah House has requested 8 lap-size quilts and one quilt for auction at their annual fund-raising drive. Unity Shoppe provides an array of services to low-income families and seniors. Doll Cradle Quilts, plus mattress, pillow and pillowcase, paired with a wooden cradle built by the woodworking class at SBCC and painted by local artists, make a Christmas gift for a young girl. The woodworkers make 168 cradles each year, along with a vast assortment of trucks and other wooden toys and gifts. We make the cradle bedding. Visiting Nurse & Hospice Care (VNHC) provides Hospice care free of charge to people in the last months of their lives. VNHC partners with the national “We Honor Veterans” program to present veterans in their Hospice care program with a “pinning ceremony” in which a veteran is thanked and honored for their service. 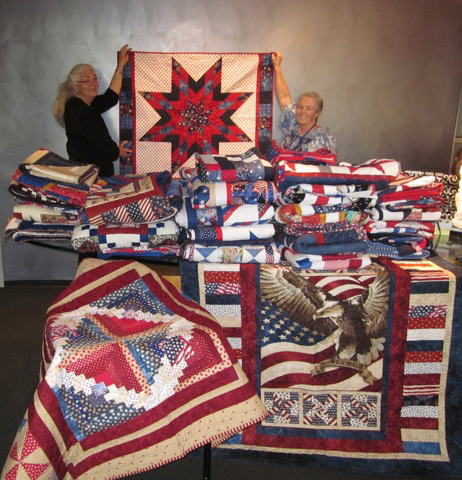 VNHC requests quilts of any size for their Hospice patients, and red, white and blue quilts for the veterans' pinning ceremonies. The Sew for Veterans Project has been focused on making these quilts, aiming for 75 patriotic quilts by Veterans Day/November meeting. 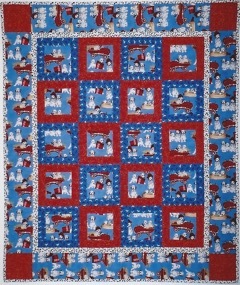 A slide show of all 93 quilts made for the Sew for Veterans Project can be seen HERE. 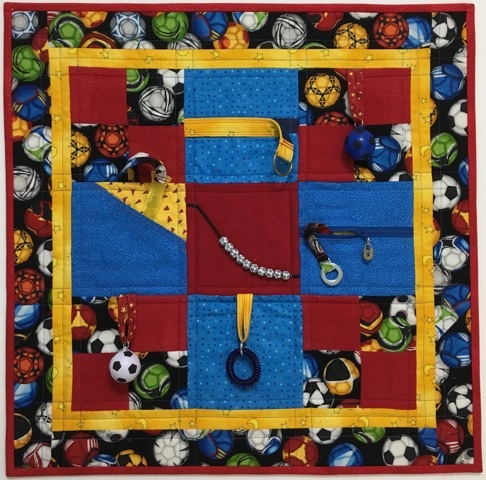 We will continue to make Hospice and veterans quilts throughout the 2015-2016 year. Visiting Nurse and Hospice Care, bringing the total for the project to 93 quilts. 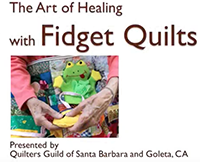 © 2015 Coastal Quilters Guild of Santa Barbara & Goleta. All Rights Reserved.